Last month, an entourage featuring anti-Semitic activist Linda Sarsour and Council on American Relations (CAIR) Executive Director Nihad Awad protected U.S. Rep. Rashida Tlaib, D-Mich., from an outspoken critic. Sarsour has espoused anti-Semitic smears worse than U.S. Rep. Ilhan Omar, D-Minn., a friend of fellow Congresswoman Tlaib, who remains engulfed in controversy following a string of anti-Semitic comments. On Tuesday, Tlaib returned the love for her Islamist crew and expressed a need to "protect" anti-Israel figures like CAIR leader Zahra Billoo. "So good to see you sis! 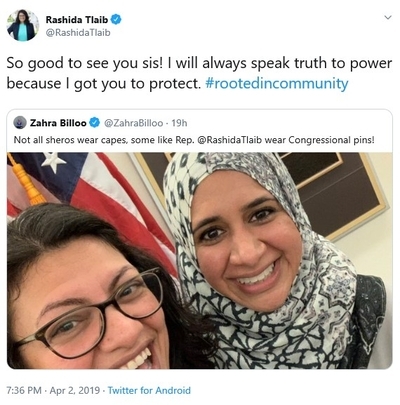 I will always speak truth to power because I got you to protect #rootedincommunity," Tlaib tweeted yesterday in response to Billoo's praise for Tlaib. "Not all sheros wear capes," Billoo wrote, "some like Rep. @RashidaTlaib wear Congressional pins!" It is unclear whether Tlaib recognizes that Billoo holds discriminatory views when it comes to "community." Billoo has repeatedly drawn a clear line in the sand concerning who she considers a legitimate Muslim leader. "I'm really cautious of who I call a Muslim leader," Billoo said at a November gathering with the Ecumenical Peace Institute, warning others to be aware "as you see countries in the Middle East, and even Muslim activists in the United States, take problematic positions supporting the state of Israel or opposing the Boycott, Divestment and Sanctions (BDS) movement." BDS seeks to isolate Israel economically and culturally. It is considered anti-Semitic because it singles out the world's only Jewish state and ignores countries with far worse human rights records. For Billoo, one cannot be a Muslim leader or activist while opposing a boycott campaign targeting the world's sole Jewish state. "I don't think of them as my leaders," Billoo said. This sentiment is expected of Billoo who, like other U.S. Islamist figures, consistently opposes any type of engagement or interfaith dialogue with organizations that maintain ties to Israel. In May, Billoo attacked Muslims who engage in interfaith relations with the Anti-Defamation League (ADL). She offered to provide her followers with a "list" of "organizations who work with them [ADL], and half a dozen or so Muslim individuals who take their stages." She has supported Palestinian terrorists attacking Israelis and openly called for the destruction of the Jewish state, in a not-so-veiled threat: "From the river to the sea, #Palestine will be free." Tlaib's praise for Billoo followed Monday and Tuesday's Muslim Advocacy Day on Capitol Hill, organized by the U.S. Council of Muslims Organizations. The USCMO is an umbrella organization that includes the major American Islamist organizations including the Council on American Islamic Relations (CAIR), the Muslim American Society, American Muslims for Palestine (AMP), and the Islamic Circle of North America (ICNA) among others. Other, more overt Muslim Brotherhood supporters from the New York-New Jersey area also lobbied members of Congress that day, including Tlaib. Tlaib broadcast her excitement in a selfie featuring several U.S.-based Islamists, including CAIR leaders from coast-to-coast: Los Angeles chapter Executive Director Hussam Ayloush and Florida director Hassan Shibly. 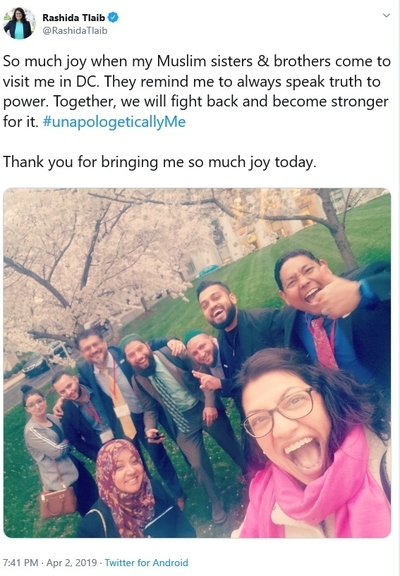 "So much joy when my Muslim sisters and brothers come to visit me in D.C.," Tlaib shared on her Twitter account Tuesday. Except these "Muslim sisters and brothers" are not members of a faith-based community that share messages of joy and peace. Many of the figures in her selfie have a long track record of spreading incitement and intolerance – especially when it comes to American supporters of the Jewish state. Like Billoo and others, Ayloush openly called for Israel's termination, while Shibly similarly refused to condemn Hamas and vilified "Israel [and] its supporters as the "enemies of God and humanity." These types of sentiments are anti-Semitic, according to the U.S. State Department's definition established in 2010. Dehumanizing Jews and "denying Israel the right to exist" are among several behaviors which constitute anti-Semitism. Unlike Ilhan Omar, Rashida Tlaib's public comments thus far have not risen to the level of explicit anti-Semitism. She does openly support BDS. Her intimate relationship to figures who do express anti-Semitic sentiments deserves scrutiny.